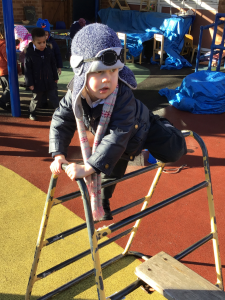 Crawling, climbing, balancing and hanging are all amazing activities for promoting upper body and core strength; necessary for a child’s ability to sit still, sustain focus and keep steady for writing. Climbing onto and walking across a high plank also takes quite a lot of courage and self-belief. 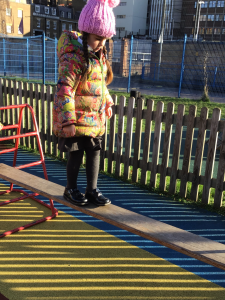 This week, our stars of the week found out, to their delight, that they were able to walk across the plank. It was an, ‘I just did it!’ moment for them both. A wonderful achievement!